Working at a school in Nevada can be a very fulfilling career. Few other careers offer individuals an opportunity to so directly impact the future. By helping to shape the minds of young people, you are also contributing to the course of society. Therefore, it is important for educators and other school employees to take their responsibilities seriously, and it is equally important for government agencies to thoroughly vet potential school personnel. The following guide will help you understand the Nevada School District Employment process. First, it is important to determine if you are seeking to work for public or private schools. Public schools may require more credentials, and private schools may be faith-based. According to the National Center for Education Statistics, private school teachers on average earn $10,000 – $15,000 less than a comparable public school teacher. However, there may be several other factors that can contribute to higher job satisfaction in private or alternative school settings. It really depends on what your primary goals and preferences are. Some education-related career titles can include teachers, librarians, and administrators. You can also get a job as an academic advisor, dean, coach, technician, and assistant. Other jobs include bus drivers, nurses, counselors, psychologists, and registrars. There are many education jobs from which to pick, including several ancillary support staff positions within educational institutions. All you need is to figure out the process of landing that job. Keep reading to learn the steps for Nevada School District Employment. Nevada’s educational goals for 2020 seek to elevate students and improve staff effectiveness. This bodes well for those who wish to work in one of the school districts. It means there’ll be more opportunities, programs, and continued investment. U.S. labor laws require employees to have authorization to work in the country. This means they should be citizens, legal residents, or have work visas. Thus, if you fit these categories, you can apply for a job. School districts post available vacancies detailing the job requirements candidates should have. They expect a General Equivalency Diploma (GED), high school diploma, or university degrees. This shows you have the training for the position you are applying for. The Nevada Department of Education provides certification for teachers. You must have a degree, pass state exams, and complete teacher-training programs. There are other tests as well such as the Praxis Core Academic Skills for Educators. A passing score for Nevada is 161. Once you complete these requirements, you’ll receive a Nevada teaching license. You can also receive an alternative teacher certification. This occurs when you have a degree but don’t complete the teaching programs. In April 2018, The State of Nevada Department of Education launched OPAL, [https://online.nvdoe.org/#/] which allows for an automated process to register and renew your teaching license in Nevada. As with many other jobs in America, you must pass a comprehensive background check. There are certain crimes you cannot commit and still be permitted around children. After you complete the educator license application forms, you must submit for your fingerprint background check within seven days. Your fingerprints and data will be scanned against the FBI’s Criminal NGI database. The criminal history results are sent directly to the licensing agency or employer; you will not receive these criminal results. Keep in mind that you may have to process fingerprint background checks for your state license and again for the school or school district in which you are employed. These agencies are not allowed to share criminal history information, and each must have this clearance. It seems redundant, but it is important to adhere to all federal, state, city, and county regulations. These background checks can reveal criminal histories or crimes of sexual misconduct. Every applicant must have experience dealing with young people. If you want a job as a school nurse, you must have the qualifications and the know-how. Specialists should know how to take care of students with special needs or disabilities. Becoming a student teacher and volunteering at schools is a great way to get experience on your resume, learn how to deal with children, and determine whether or not this is something you would like to do long-term. In addition to having experience working with children and undergoing a background check, specific jobs will have their own unique requirements. Some positions, such as bus drivers, need to have a Commercial Driver’s License (CDL). They may also have to show their driver histories. Additionally, according to the NDOE bus driver training manual, drivers must be willing to submit to a pre-employment screening for controlled substances and provide a medical certificate after being examined by a federally certified registered medical examiner. Other positions, like custodial jobs, require applicants to provide proof of custodial-related experience, pass the pre-employment drug screen, get a physical, and pass a lift test. Some positions within school districts may require the applicant to pass a civil service test. Be sure to thoroughly review the requirements of the specific position you are interested in before applying. Finding a job in a school district in Nevada is not difficult. If it is your passion to work with kids, this is a great state to seek employment. Make sure you have all your documents in order. Moreover, be forthcoming with your past. Your employer should know if something hinders you from working near children. Background checks will reveal it eventually. Honesty is the best policy in disclosing your history. Fingerprinting Express is an approved fingerprint livescan vendor for The State of Nevada Department of Education as well as the Carson City School District and several private and charter schools. Contact us to learn more about background checks. Are you seeking Nevada school district employment? Look no further than Fingerprinting Express! 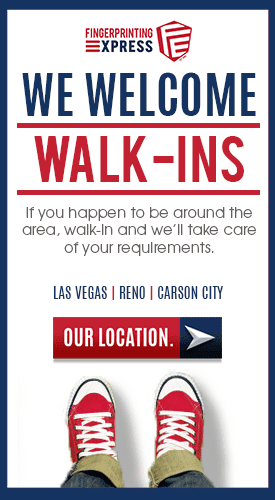 Our fingerprint store in Reno can help you on your journey to employment. Visit us today to get support with your background check!